Experience a luxury rail journey of discovery through some of the most scenic areas of South Africa and Namibia, including Etosha National Park, on this 9-day train safari.Board the luxury Rovos Rail train and embark on a memorable and elegant journey across South Africa, through Namibia, and ending in Swakopmund. Stop along the way at Kimberley and the Big Hole, as well as the Fish River Canyon, before taking in the stark beauty of the Namib Desert and Sossusvlei. 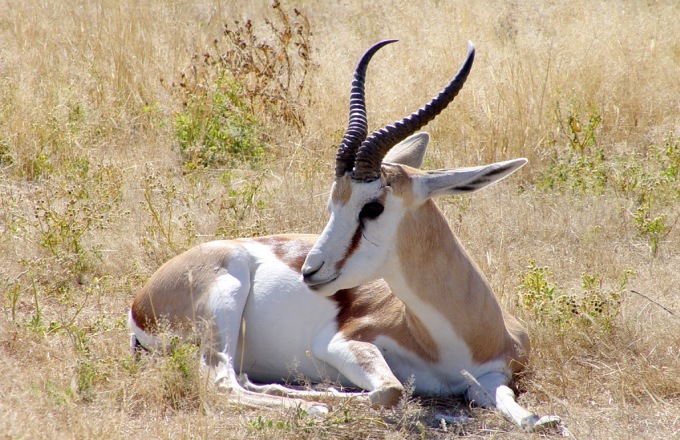 Stay overnight at a game lodge near the Etosha National Park before arriving in Swakopmund. No reviews yet for this trip. Browse other reviews below for Go2Africa. I recently shared a two week long trip with my family to South Africa and Zambia. It was truly an amazing trip that we will all cherish for the rest of our lives! We recently returned from our vacation. I was very nervous about using an over seas travel agent, but I am glad I did. Mary was exceptional. Even with the time difference she always got back to us quickly. All their suggestions were spot on. Our plane got delayed by a whole day (a fault of the British Airways) and Mary took care of our car and hotel delays. I would recommend them for any trip. Thanks for everything, South Africa was the most amazing place I have ever been. We will use them when we go back in a few years. Rikke at Go2Africa arranged the most amazing trip to South Africa for our family. Our expectations were hugely surpassed by the glorious locations at Sun City and Madikwe game reserve. Etali Safari Lodge was quite simply heaven on earth and we cant wait to go back again one day. All arrangements were flawless and we enjoyed our best holiday ever- it was my 50th birthday celebration trip and was utterly fantastic!! Depart from Pretoria’s Capital Park Station in the late afternoon. Experience the excitement and atmosphere of luxury rail travel as this historic steam locomotive hauls the train through some of the most historic and scenic areas of Southern Africa. Enjoy a delicious 3-course dinner in the oak-panelled dining car. Dress for dinner is formal as the evening recreates the romance of a bygone era. This morning, you’ll arrive in the famous diamond town of Kimberley for a brief morning excursion to the Big Hole Diamond Mine. Head back to the train before lunch to continue your journey towards Namibia. This morning stretch your legs with a tour of the South African town of Upington - a former mission station on the Orange River. Board the train again in the late morning and head towards the Namibian border. After some border formalities in Nakop your journey continues to Holoog Siding near the famous Fish River Canyon. Enjoy an evening on the train before leaving the next morning for Fish River Canyon. This morning you’ll enjoy an excursion to the spectacular Fish River Canyon, the second largest canyon in the world, where you’ll have the opportunity to stand on the edge and marvel at the sheer size of this dramatic geological feature. This is followed by lunch at Canyon Lodge before you make your way back to the train to continue your journey to Windhoek via Keetmanshoop. Enjoy a walking tour of this small colonial town. Arrive in Windhoek where you’ll enjoy a visit to the Station Museum before heading out for a city tour of this lively and cosmopolitan city with a strong German flavour. Following the short tour of Namibia's capital, you'll board a light aircraft for a flight to the famous Sossusvlei sand dunes. Enjoy a scenic drive in the afternoon to marvel at the rugged terrain and large mountains. Wake up early to set out on excursion to view some of the world's highest sand dunes in the Sossusvlei region. Take a walk to the stunning Deadvlei - a clay pan dotted with dead camelthorn trees. Enjoy seeing the region by air as you fly back to Windhoek around the lunch hour to board your train and continue the journey north to Etosha National Park. On arrival at Tsumeb in the late morning you will be transferred to Mokuti Game Lodge in time for lunch. Mokuti Lodge is situated on the eastern edge of the game-rich Etosha National Park. You will then have some time to relax at the lodge and settle into your thatched chalet before being taken out on a game drive. You’ll start your day early with a game drive in the Etosha National Park before heading back to Mokuti Lodge for breakfast. Departure from Tsumeb by Rovos train will be at 13h00. Arrive in Swakopmund - a perfectly preserved 19th-Century German town set between the dunes of the Namib Desert and the roaring Atlantic Ocean – where your elegant rail journey comes to an end. In the event that you cancel your booking, in full or partially, for any reason whatsoever Go2Africa will levy cancellation charges as defined in 7.3. In the occasional instance where Go2Africa is able to obtain waivers of cancellation fees and/or secure an ex-gratia refund from suppliers Go2Africa will pass this on to you less the Service Fee. However, Go2Africa makes no guarantees as to securing such waivers or refunds. Cancellations of bookings must be done in writing. Where cancellations are sent by e-mail, you must obtain an e-mail proof of receipt and retain written acknowledgement of receipt from Go2Africa. Go2Africa will make every effort to confirm your requested travel services upon receipt of your deposit payment. In the unlikely event of us being unable to confirm your requested travel services, you will be offered alternative available travel services. Should the alternative available travel services not be acceptable to you, we will provide a full refund, subject to the terms and conditions of the relevant Supplier. Go2Africa will make every effort to avoid misquotation. However we reserve the right to cancel a reservation without liability or penalty if an obvious error or omission leads to a material cost implication. No refunds will be given by Go2Africa for partly used vouchers or for no-shows.